Showing results for tags 'daughters of khaine'. Well, I decided to start a painting log. I’m not sure how well I will keep up with it, but here it goes. I started with Warhammer back in 5th edition and 40k during 2nd. Dwarves and Eldar were a strange pairing. I’ve painted a variety of armies and took a break for a while there. I really didn’t care for fantasy 8th and 40k 6th/7th. However, AoS finally got me back in and I love 8e 40k. I started back in with Khorne Bloodbound and have a large army and have dabbled in a few others. I’ll try to add pictures of other stuff later. I’m currently working on Stormcast because I like the new Soulwars stuff, but I didn’t want to go the gold route. So, I decided on Hallowed Knights. I got a new airbrush (Badger Velocity) and layer down Leadbelcher, Ironbreaker, and Runefang Steel. Then I gave them a wash of 50/50 Drakenhoff and Nuln Oil Gloss. I kind of wish I would have thrown down a gloss coat first to put it more in the recesses, but I think it will work. My next step is to give it a good dry brush of Necron Compound. My converted Sequitor Prime. I used the easy build prime and added the easy build castigator prime’s arm and helmet. The extended the hammer handle to make it a great hammer. The list style that I am currently looking at is MSU with plenty of magic and shooting. I want an army that competes in all areas of the game and can answer the key questions that I think you need to consider anytime you write a list (assuming your goal is to win games!) 1. What if you can't out fight your opponent? 2. What if you can't outshoot your opponent? 3. What happens if your opponent is immune to your trick? This is by no means an all encompassing strategy for Age of Sigmar, but it does cover the basics of list design and means you should have a flexible list. I am fully aware that many of the top lists bypass there rules and focus on being ultra powerful in a single area of teh game, playing the meta to stay on top. It is also those lists that will be swapped out every few moths as things rise up to counter them and a new hot list emerges. I prefer to play a list that is alway viable without having to worry about hitting a hard counter, or a swinging meta. So let's look at this in more detail and I'll go on to show how I have thought about this from both sides. 1. What if you can't out fight your opponent If you bring a full combat army, and you have no other options than to win a straight up fight, if your opponents army is better at this then you will lose. You need to have a plan B. It doesn't mean you need to bring some shooting, some factions just can't do that. But it might mean making sure you go 2-1 in flights, or that you can snipe off their support characters, or debut the units. Making sure you have a plan for this is important. In my list I do not go for the full combat assault, I have a mixed arms army so fighting is not my first option. I can magic and shot my way to a victory if needed. If my opponent does need to win only by combat, and have no other plan to back that up, I have the option to tie them up with Morathi, or buff my Bloodsisters so they hit hard enough to kill most units. I have plenty of options to sit back and avoid combat if needed. I can reply on the table edge and still have my key units engaged in the game. Morathi can cast spells with a huge range too. 2. What if you can't outshoot your opponent? Have you considered what happens if your bring a shooting army and face something that you can't outshoot? Maybe its Stormcast that present no targets, come out of the sky and shoot out your important missile units? Or you face something that is 1 drop and does the same? Or gun line with longer range. Are you able to get over the table quickly enough to stop getting blown apart? For my list it's all about the Khailebron Temple here. -1 to be hit from shooting. Its a great defensive trait against shooting armies. I also have the chance to close quickly with the Mistress of Illusions move, and the Mirror Dance. Heartrenders to drop out of the sky and my allied Ballistas to put the hurt down from range. 3. What happens if your opponent is immune to your trick? If your army relies on one trick to win, and your opponent can nullify that, can you still win. For example, 1 Drop battalions with a strong Alphastrike. What happens in Total Commitment or if you plan another 1 drop army and do not get the first turn? I have tried to include a few powerful combos the can be game winning, but not something that I will rely on. The biggest trick here is having Morathi use the Mirror Dance after transforming and being bused to be able to charge pretty much anywhere on the table. I also have the ability to put out a massive amount of mortal wound damage in the hero phase. My list and how this applies. Morathi High Oracle of Khaine (480) - Lore of Shadows: Mindrazor Bloodwrack Medusa (140) - General - Trait: Mistress of Illusion - Artefact: Shadow Stone - Lore of Shadows: Mirror Dance Hag Queen (60) - Prayer: Catechism of Murder The 3 heroes work will together. Mistress of Illusions can move a unit, but it can also place my characters where they are most needed. If I buff morathi and send her flying away, then next turn I can teleport the Hag to her and buff again. The Shadow Stone and Mirror Dance is a great combination, you would need to roll snake eyes twice to fail to cast the spell, so the teleport combo will go off if I am careful about placement. That Combo.... Heres how it works. Start of the turn I can use the Mistress of Illusions command trait to teleport a unit anywhere on the table outside 9" of the enemy. 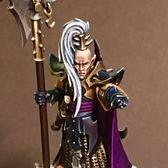 I can then transform Morathi into the Shadow Queen. I need to teleport a hero, and keep her within 24" of my General, and Morathi (this could mean I teleport my general) I can then cast Mirror Dance with the Medusa and swap the position of Morathi and the Character I already moved forwards. Morathi is now free to move. This also works well on teh medusa. V2. Khailebron move Morathi (In high Oracle form) so she can cast spells and do some damage. Cast Mirror Dance to pull Morathi back to safety and swap in the Medusa. The medusa is now free to move and shoot. This can get the gaze in range early on and blow up large units before they have chance to get any command points on the board. Its a nice trick! Its also great for keeping Morathi in the game and not getting isolated out of the battle. 10 x Blood Sisters (280) My hammer unit. Every list needs something that can just line up and deal out the pain. They are also battleline 10 x Witch Aelves (100) - Sacrificial Knives and Blade Bucklers 10 x Witch Aelves (100) - Sacrificial Knives and Blade Bucklers Battleline. Mainly defence against alpha strikes. thats why they have bucklers. 5 x Doomfire Warlocks (160) - Lore of Shadows: The Withering 5 x Doomfire Warlocks (160) - Lore of Shadows: Pit of Shades I like 1x 10 but i'm trying out 2x5 for now. Lots of options for spells and unbinds 5 x Khinerai Heartrenders (80) 5 x Khinerai Heartrenders (80) Celestar Ballista (100) Celestar Ballista (100) Celestar Ballista (100) These 460 points are flexible. I think I will end up tweaking them around to settle on the best options. I like the ranged shooting, most armies I see recently are combat heavy hat will be forced to advance onto objectives. The 3 Ballistas should punish that. Aethervoid Pendulum (40) Quicksilver Swords (20) The endless spells are so I can really throw out the damage if needed. 6 casts in my list. if needed they can all be damage spells. Total: 2000 / 2000 So thats the list. My next post will be a review of recent games and how it is performing. Fire, ice, light and shadow. An Aelf collection project. Hi everyone! Been in the hobby off and on (mostly off) for 23 years. My Dark Elves started around 2005 with a box of spears, then when the plastic corsairs came out, a couple of boxes of them and some cold ones. Collected a load more again in 2009 ish, but again, they've remained unassembled or grey. Always meant to start afresh with the launch of AoS, but yet again, life took over. Well, it's time to start again. Order Serpentis, 1k to start with, using models I already own (a few more than I can use pictured): Will be using the dragon (a High Elf conversion pre the Dark Elf launch dragon), a hydra (new to replace the ancient metal one!) 2x5 Dreadknights and I can choose between the chariot, sorceress and assassins to begin with. Theme: Blue skinned, though going to make this more grey with the unpainted models. Purple plate armour, silver chain mail, glossy black, bits of gold, and blue green style sea dragon cloaks. 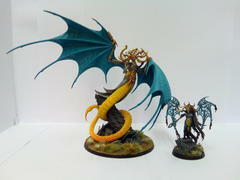 Unsure of colour for the hydra or dragon (black, but thinking of the highlight). The snow bases will be redone, now I have some actual snow stuff to use! First model, to ease me in, was selected by my 7 year old son. I hoped he'd pick the sorceress, but selected another assassin: Think he liked the claw! Aiming to have a good chunk ready by the end of March, playing the first proper matched game on 23rd with a mate who is also returning to the hobby! Hope to have most done by then... We'll see. Any more pics wanted, any questions, please ask!